This is a reprint of an interview I did with Dan Lavender, one of the three “fathers” of “The Calamari Sisters,” that I wrote in 2012 when it appeared in the Delaware County Daily Times. “The Calamari Sisters” appear at the Bristol Riverside Theatre through Sunday, August 3. Get three theater professionals in one house in Fire Island over a weekend and what else would they do but write a show? For themselves to perform in and direct and in the hope they channel the spirits of Dan Goggin (“Nunsense”) and Stuart Ross (“Forever Plaid”) and come up with a hit that sells coast-to-coast, becomes a franchise, and spawns Christmas and other versions of the original show. Dan Lavender, Jay Falzone, and Stephen Smith are multiple theatrical threats. Their careers include acting, directing, choreographing, costume, makeup, you name it. The trio was sitting in Lavender’s Fire Island home one weekend and began talking about the dinner parties their Italian families held and all of the cooking, and drama, that went into them. The next thing you know, the party moves indoors, a rap session is held on Lavender’s couch, and Falzone, “the organized one,” is taking notes. The Calamari sisters, Carmela and Delphine, are being born. Or created. 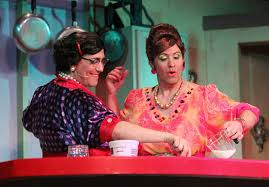 So is the play, “The Calamari Sisters,” which currently appears at the Bristol Riverside Theatre with Falzone and Smith as the sisters who have a cooking show on cable and Lavender directing. The show ran at Philadelphia’s Society Hill Playhouse in 2012. “We were literally sitting and having cordials,” Lavender said. “You know, good Italian cordials like sambucco and amaretto, when the memories started flowing. “All of a sudden we have this idea about two big fat Italian women who host a television show. The sing, they tell stories, and they share recipes. The women are underdogs, but you root for them, and they are entertaining. We came to Fire Island for a weekend and stayed for a week. We just cleared our schedules so we could improvise and frame scenes. We used ‘Forever Plaid’ as a model. We all had experience with that show, and we admired it and how Stuart (Ross) structured it. “We also knew what we didn’t want to do. We didn’t want to wrap a silly plot around pop songs or parodies of pop songs and pass that off as off-Broadway quality entertainment. I’ll tell you the shows to which I’m referring off the record, but you know which ones they are. Jay, Steve, and I wanted more substance. We wanted to create characters they audience could embrace. And not just because of their size! “We use popular songs, but they fit with our Italian theme, songs like “Mambo Italiano,” you know the one that was a hit for that great Italian artist, Rosemary Clooney. “Jay, Steve, and I were involved in so many shows. Jay and Steve have been in dozens of choruses, and I have been the assistant director on numerous shows. We had all taken a variety of theater jobs. We had worked in the theater our whole lives. We knew costume and set, and best of all, we could improvise. “That experience was invaluable. So was our knowledge of what works with an audience. I run a booking company, and I know that theaters are looking for polished commercial product. They don’t want schlockola. “We were promoting our idea, our writing, and our pedigrees. Of course we were seeking an enthusiastic audience reaction, but we wanted to earn by presenting a quality show that had its moments of camp and vaudeville and its moments of pathos and character. “Characters are the key. The audience has to enjoy the time they are spending with the people on stage, with Carmela and Delphine, and they have to walk out of the theater satisfied that they’ve seen a great show. The audience doesn’t have to realize the structure. They should just sense they’ve seen a quality product and not one that looks thrown together. Lavender is entertaining and animated as he talks about his creation. “The Calamari Sisters” has already morphed into several versions, and word is spreading about the show. I chose to speak to Lavender because Falzone and Smith only do interviews in character, and I didn’t want to present a stock comedy act as a newspaper article, as amusing as that might have been. The rap session Falzone recorded framed the show. An ante pasta would be in 12 minutes with “Volare” playing in the background. The cannoli contest would take the form of the famous “I Love Lucy” scene when Lucy and Ethel take jobs dipping candy in chocolate. “We played around with what we considered the essential material and then discussed how to make musical numbers. We referred to Jay’s notes and streamlined as we went. It was quite the creative experience. We had fun while working hard and deciding what would go into a show we wanted to be praised for its writing as well as for its entertainment value. Beyond material, Lavender and company has to make some decisions about the show. The names of the sisters, for instance. They also had to find a venue to test their show and see how well an audience accepted it. “Jay grew up in Rochester, N.Y. We went there and set up in a little 99-seat theater. Jay’s relatives could carry us for at least our first week. We were booked for three. We stayed the season. Before we finished previews, tickets were hard to get. Word of mouth propelled us into being a hit. “We repeated our success in Florida and Toronto. We stay hands-on, but others have done “The Calamari Sisters.” It had to, and has to, be able to be done by other casts. Carmela and Delphine cook on the set. The range the audience sees is real, but the heat is actually backstage. The audience gets treated to some of the preparations Carmela and Delphine make for their show, which appears on the station, WFAT. “The show the audience sees is allegedly the final episode. The cooking segments are inspired a little by Rachael Ray, a little by Giada de Laurentiis, and a lot by our Italian relatives. “The Calamari Sisters” runs through Sunday, August 3 at the Bristol Riverside Theatre, 120 Radcliffe Street (on the banks of the Delaware River), in Bristol, Pa.. Show times are 8 p.m. Friday and Saturday, 2 p.m. Saturday, and 3 p.m. Sunday. 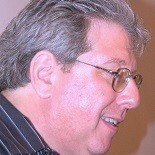 Tickets range from $45 to $30 and can be ordered by calling 215-785-0100 or by going online to http://www.brtstage.org. This entry was posted on August 1, 2014 by nzoren in Interviews, Theater Previews and tagged Bristol Riverside Theatre, Comedy, Dan Lavender, Drag, Food, Jay Falzone, Revue, Stephen Smith, The Calamari Sisters, Theater.